At the beginning of this project, I reached out to producers who were working in numerous virtual worlds, such as Star Trek Online and Habbo Hotel. 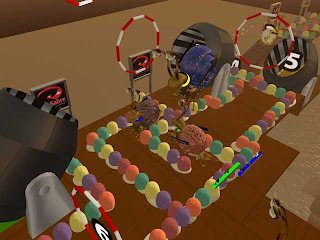 The fact that the analysis of the project rests largely on productions in Second Life is due to how many of those VWTV producers participated in the interviews. Just this week, rather out of the blue, I heard back from one of the other non-SL producers I had contacted over a year ago. J.J. Mitchell, of Omega Fanfilms, is the producer of the Maroth’s Revenge episodes and The Wrath of Maroth, which were initially constructed using the MMORPG Star Wars Galaxies. He very graciously emailed me with a description of what led him to start such productions, and we have conversed via email to more fully explore his thoughts on machinima and virtual world television. What follows is a description of his experiences and opinions, in J.J.’s own words. I am always happy to answer a few questions on machinimas. As a little introduction to them, I guess I could start by saying that I have always enjoyed watching fan films for as long as I can remember. Especially those in Star Wars. Be it from TROOPS or Essence of the Force to name a few. Once I was able to get a YouTube channel going, I gathered a few friends from a guild of mine in Star Wars Galaxies to create a story in Sony Online Entertainment’s Star Wars Galaxies, back around 2008 or so, with that being Star Wars Galaxies: Maroth’s Revenge. Originally as it did contain a new story set more for the darker side of Star Wars, the fan film meant to also help me test various editing abilities from the basic Windows Movie Maker installed on most Windows operated computers. The story follows an adult Rodian male whom was betrayed during a battle, hauled away, and then imprisoned/tortured for several years until he breaks out — now insane and bloodthirsty. However as a quality video it had its many flaws. So as time grew on and I made other fan films and trailers to mods and such, I began devising adding more to the story of the character known as Maroth — about him going into a second attempt at defeating his enemies after being horribly beaten. 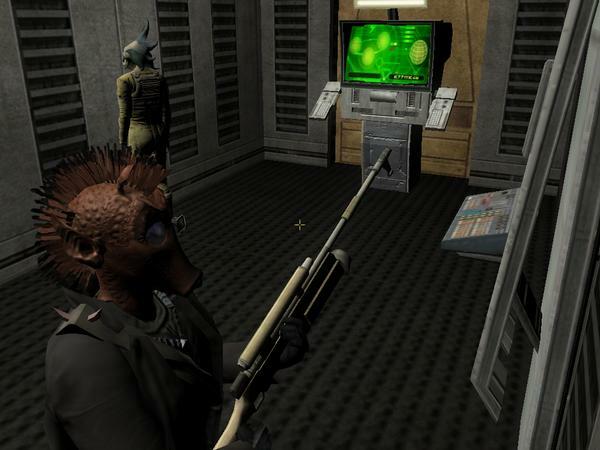 Once the concept was done with, the show became known as Star Wars Galaxies: The Wrath of Maroth. Sadly the show could not be completed due to online game expenses and the game’s official closure in December of 2011, which left the show halfway completed. From there, however, Maroth’s story wasn’t over. With Star Wars Galaxies being shut down, we looked to a more alternative method of machimina productions, in the virtual world known as Second Life, where the reality is completely user created. Anything from constructing basic objects to various atmospheric effects. This has proven time and time again as a great potential for machinimas as there are practically no end to the possibilities of what one can make there. The show, now a work in production with a new name, The Maroth Chronicles, has no set release date as we are still planning for better upgrades, such as voice actors, animations, and custom built sets. That just covers some of that story. Omega Fanfilms does a lot of machinima work, such as the more popular series Star Trek: The Unknown Frontier, which we did as our own take on how a Star Wars versus Star Trek video series would pan out. A very easy project, we used the game Star Wars Empire At War: Forces of Corruption combined with the mod Trek Wars: Federation at War to create Star Wars versus Star Trek battles. And from that we used stock footage of Star Trek scenes combined with in game footage of cutscenes and game play to create the illusion for our story of the USS Enterprise E going back in time and into an alternate dimension, and then meeting with the USS Enterprise D to fend off the evil forces of the Empire as they try to conquer the Milky Way Galaxy. I would say there are some similarities for television and machinimas. My YouTube channel, like any TV production, has a team that covers certain bits and jobs. However those on a TV series definitely have more people on set, from editors, actors, story board artists, producers, etc. Here on Omega Fanfilms, I lead a small group, much like those on an actual TV studio. I mostly do the editing, some story writing (pending on what is currently being produced.) My team each shares in a little bit of everything when it comes to the final productions. My group is usually four to five volunteers, give or take. My group will gather around, shoot out some ideas, we’ll talk on it. Then we will set up our 3D set. The work will vary on that bit pending on what’s being used. So, for example, our latest project, a Babylon 5 based fan film/machinima called Shadows of Earth, is being produced in Second Life, where we have no limit on what we can build as a set. We’ll all get together, build up, say, a starship bridge, set up our actors, get them in a few recordings, and then it gets to the first stages of editing. I’ll load up Windows Movie Maker and begin working. From there we’ll get back to the set and begin recording the voice over pieces, and then I will go back and add that. Generally that can take several takes, which can result from a number of difficulties, from glitches in the audio recording or messing up in some of the lines. So there are some similarities to actual television. I’d say the main difference is the amount of workers and jobs they do, the money involved, and the more superior editing technology. Most of my work has been episodic, starting from Star Wars Galaxies: The Wrath of Maroth, mainly due to the fact that during its initial production I couldn’t upload videos longer than a small amount of minutes. So our team decided we’d have to release it in parts. Now Wrath of Maroth could be considered a second part to the series. We never really gave it a title in truth. Nowadays as we begin to reopen Omega Fanfilms, we have enough to upload longer than fifteen minutes, and thus our next series may be a bit longer. Especially with a new computer in the works. There is a a decent bit of difference when the final production is rolled out. Especially in Wrath of Maroth and Maroth’s Revenge. Back then we lacked the ability to have voice overs in our videos, and thus made it a format similar to those of soundless movies. Sure, we had background sound and ambient effects, just no voice. So in order to make up we used subtitles. Mainly that was the largest difference right there. However, in the newer productions we have better equipment and now the ability for voice overs, all of which will be used when our videos will be finally launched. I would love to get into traditional television if given the opportunity to do so. But getting in the television business is a long and hard road for most. And considering where I am at now it would definitely be so. So unless that does happen we will continue to try and improve on our techniques for our fan films here at Omega. Is there a future in virtual machinimas? Absolutely. I see tons of productions every month being produced and generally receiving good and decent views. As for Omega Fanfilms, we will continue to try and produce machinimas and fan films once the main computer is replaced with a more powerful machine.